Taking a clip from Wikipedia, the Red Lady Pirate (Veronica) circa 1500-1534 was one of the most cunning pirates of the sixteenth century who never revealed her identity. She commonly disguised herself as a singer or an entertainer to be brought on ships and once the crew ever advance on her or leave her by herself she would take her disguise off having a top, pants and her weapons underneath. She would then immediately kill all aboard the ship and sail to sea. There is something about Nora Corbett's "The Red Lady Pirate" that captivated me from the start. I just always loved her. 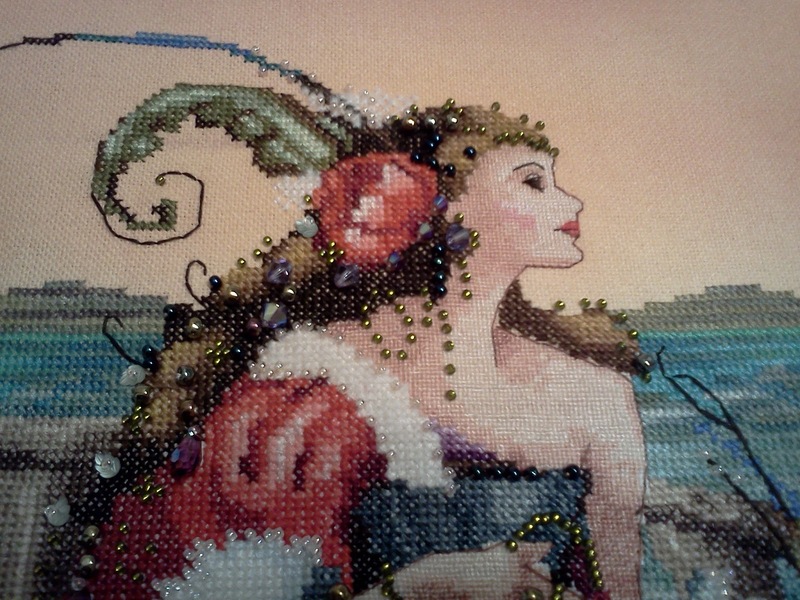 I bought a piece of Sunny Dyes Pacific Sunset fabric a full year ago knowing that it was the perfect fabric for her. But I never really got her in line for my to do list. 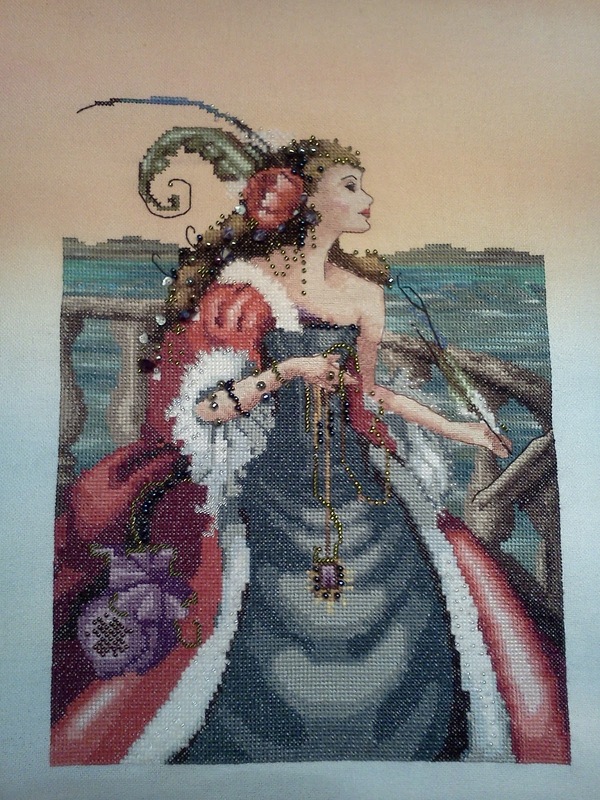 I was given the choice to kit any pattern from Hawkins Hobbies, and I chose Red Lady - but I still didn't put her in my rotation. 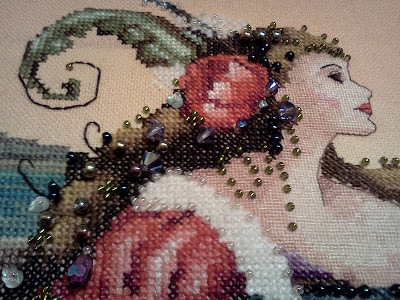 After awhile I knew I wanted to stitch her - but I had to finish this, that and the other. Finally with encouragement from Facebook friends I decided to start her. 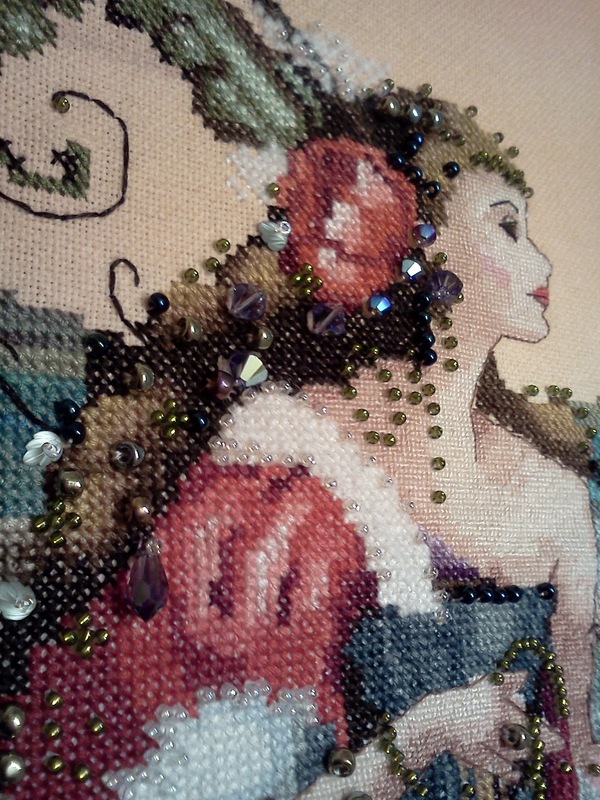 I enjoyed every minute of stitching this project. I can say that about very few. There was no "crappy spots" or screw ups. She just flowed. 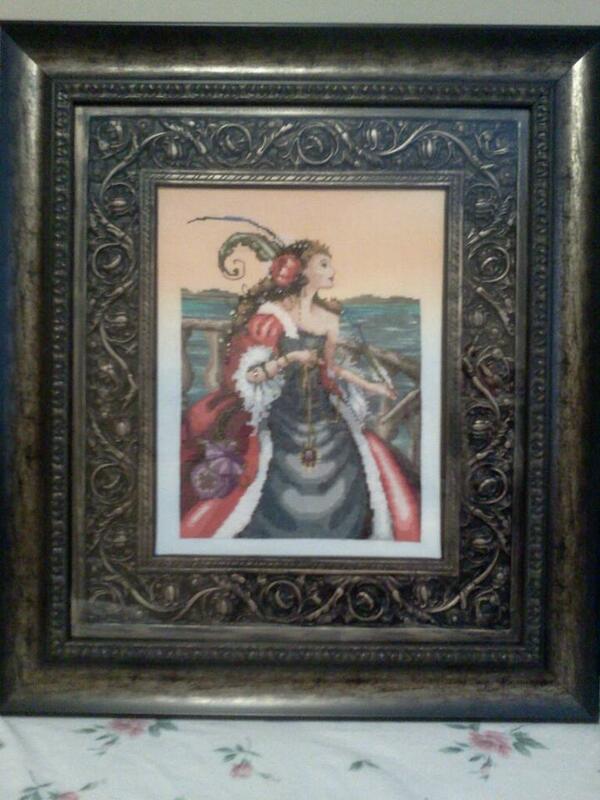 The Red Lady Pirate is a goddess of the sea. She is dripping in jewels and beads. She is lavishly cool, cunning and beautiful. I would say, my favorite stitch to date. Her skin is stitched 2 threads over 1. The water and mountains are variegated silk called Waterlilies. 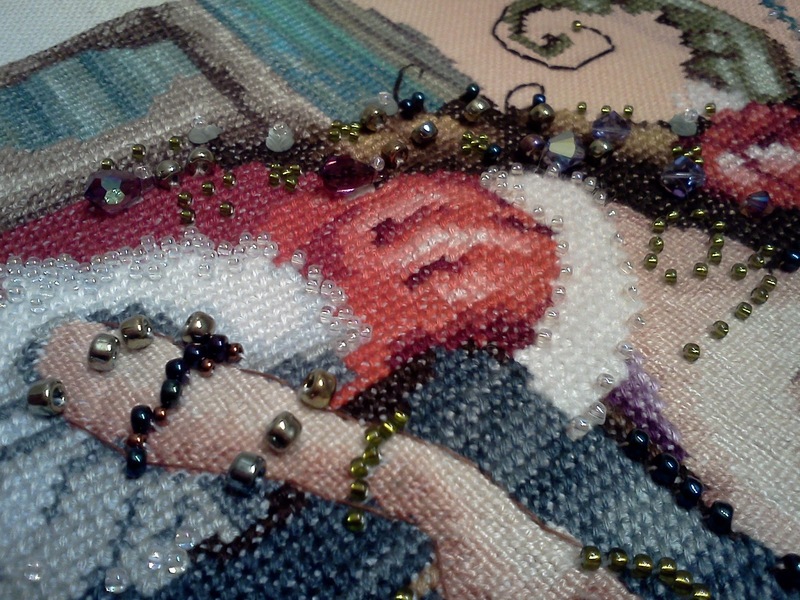 She is covered in treasures and beads. A pure masterpiece. Many of my projects will take residence in my closet unframed. 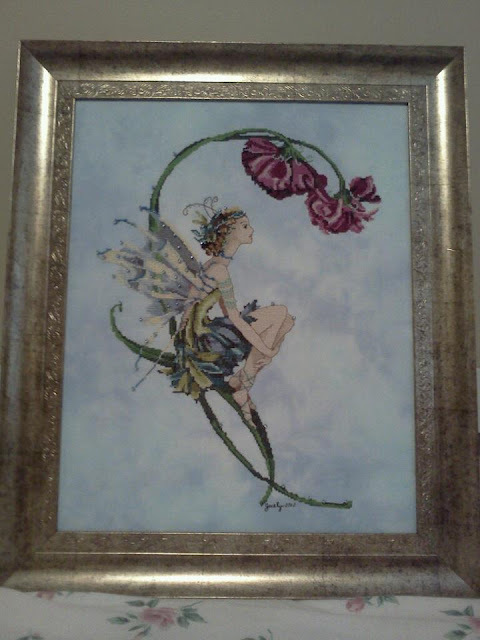 I was so inspired to get her framed that two days after my finish I went to Michaels and found an amazing frame. I did frame this myself. At the same time I got frames for Bliss Fairy and Christmas Flourishes. I framed those too. Happy New Year to me! I really should watermark these photos. I have had pictures from this blogged stolen before - cute right? 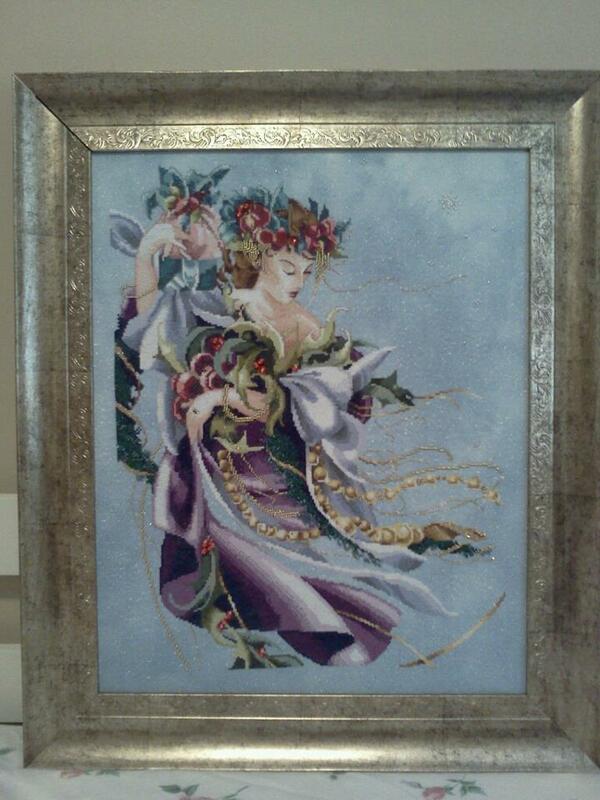 Someone goes on Facebook and uses my stitched piece as their profile picture and claims it as their own. Little did they know that pattern had a pretty obvious screw up so I know it was mine. I ousted her - for all the good that did. But for now - I leave my photos as they are and hopefully they will inspire someone to someday stitch these Nora beauties too!